September has drawn to a close, but the birding excitement may just be getting started, depending on where you live. Migratory season can last a while, so pace yourselves! I finally made it to one of my favorite patches, but all I found were swarms of agitated chipmunks. They must have chased the birds away! Fortunately, two White-throated Sparrows proved courageous enough to withstand the chipmunk horde. Normally, the Dickcissel that Corey found while watching morning flight at Fort Tilden would easily be his Best Bird of the Weekend, especially as he saw two on Saturday morning. But another more common bird took the prize for Corey this weekend. 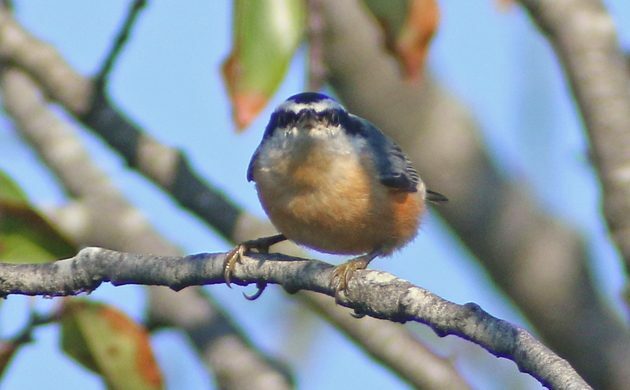 After all, when a Red-breasted Nuthatch goes so far as to land on your head, as one did with Corey this weekend, you can’t help but to make it your Best Bird of the Weekend! Yesterday afternoon while walking the baby home from the playground in our NW Philadelphia neighborhood, I heard and then saw Chimney Swifts wheeling overhead — nice to get to say goodbye to my favorite birds before they head south! Right after driving out of Texas, on our way to New Mexico, two Scissor-tailed Flycatchers flew right in front of us. I was not able to stop the RV on a main highway, but later in the day I tracked down 4 more, and got some nice photos.